One of Scotland's most iconic landmarks, Edinburgh Castle looms above the city's dramatic landscape. It welcomes almost 2 million visitors annually and has its illustrious history on display for people to admire. If you are on a mission to explore the wonders of Scottish history, you should not miss the castle. One of the most popular tourist attractions in the world, Edinburgh Castle has a turbulent history. The castle has a treasure trove of secrets and plenty of myths and mysteries to entertain you. Edinburgh isn't so much of a city, more a way of life…..I doubt I'll ever tire of exploring Edinburgh, on foot or in print. ‘it seemed as if the rock and castle assumed a new aspect every time I looked at them; and Arthur's Seat was perfect witchcraft. I don't wonder that anyone residing in Edinburgh should write poetically. There's no leaving Edinburgh, No shifting it around; it stays with you, always. Why Is Edinburgh Castle Famous? Is Edinburgh Castle Worth The Money? Is Edinburgh Castle Free On St. Andrew's Day? Can You Walk Around Edinburgh Castle? What To Expect From Edinburgh Castle? How To Get To Edinburgh Castle? How To Get The Most Out Of Edinburgh Castle? How Much Does It Cost To See Edinburgh Castle? Castle Rock, on which Edinburgh Castle stands, is estimated to have formed some 350 million years ago. For centuries, the castle housed several Scottish monarchs. After Edinburgh was captured by King Malcolm III, it became an important royal site for him and his descendants. His beloved wife, Queen Margaret died there in 1903 and the castle was also the center of King David I's rule. The English and the Scots fought for control of Edinburgh Castle for centuries and throughout history, the castle changed hands several times. The castle became a royal residence from the 12th century until 1633 when Charles I became the last Scottish monarch to inhabit the castle. Mary, Queen of Scots, Scotland's most famous queen, gave birth to James VI in the Royal Palace in 1566. The Portcullis gate was built on the ruined 14th century Constable's Tower and it is a formidable obstacle to any who plan to attack the castle. The New Barracks were completed in 1799 and it provided accommodation to 600 soldiers. 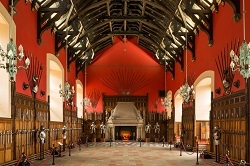 Built before the death of King James IV in 1513, the Great Hall served as the main hall for state assemblies in the castle. 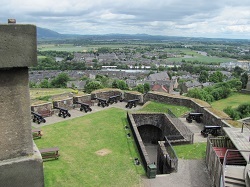 The Half Moon Battery is a prominent feature on the castle's east side, and it gives canons a wide angle of fire behind tall and unsurmountable walls. Margaret's Chapel is the oldest building on the site and is also the oldest building in Scotland. It was built in memory of Queen Margaret. Edinburgh Castle is the most besieged place in Great Britain. It has faced hostile forces 23 times and some of the notable instances include the Longshanks Siege of 1296 and the Lang Siege. The Scottish crown jewels were lost in the castle for a number of years. The castle is haunted by the ghost of the Lone Piper. The castle is famous for its long history and the number of monarchs who have lived in the castle for centuries. The constant conflict the castle was involved in resulted in renovations, on-going repairs, and additions that included the construction of more towers, halls and barracks. With all the constant work, it is not surprising for the castle to have become such an imposing structure. It has played an important part in military and defensive history of Scotland. Today, it houses the “Honours of Scotland” or the crown jewels of Scotland, It is also an active military base. 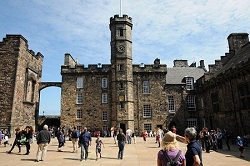 Edinburgh Castle has consistently received top ratings in Trip Advisor and is recommended by visitors for people who want to visit Edinburgh and Scotland. Voted as UK's top UK Heritage Attraction at the British Travel Awards, it is also Scotland's number one paid-for tourist attraction. 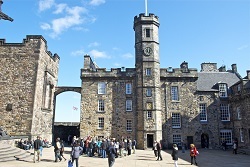 Edinburgh Castle hosts a myriad of events to showcase its history and tradition to visitors. Each summer, Edinburgh Castle’s Esplanade is transformed and becomes a unique concert venue. Some artists who have graced the stages are Boyzone, Rod Stewart, Westlife, Lionel Richie, Simply Red, and Tom Jones. One of the most spectacular shows visitors will ever see is the Royal Edinburgh Military Tattoo. Hosted each year on the esplanade, it brings together performers and musicians from all parts of the world for a fabulous display of international culture. The Royal Edinburgh Military Tattoo is not run by Edinburgh Castle. Tickets can be booked online through The Royal Edinburgh Military Tattoo website. Edinburgh is a historical and cultural treasure and deserves a visit at least once. At just a fraction of the cost of other tourist attractions, it is definitely worth a visit every penny spent. Thousands of free tickets for various attractions, including Edinburgh Castle, are given away as part of St. Andrew's Day celebrations. 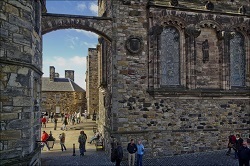 Yes, it is possible to walk around Edinburgh Castle, but it is very important that you wear comfortable shoes and clothes to get the best of your self-guided walks on the castle grounds. You may also check Edinburgh city passes which include the castle on their itinerary. Rising up form Castle Rock is the famous Edinburgh Castle. The most visited attraction in Scotland, it is so popular that it can get quite crowded, especially during summer months. There are many things to see at the castle but the most popular are the Crown Jewels of Scotland. Another highlight in the castle are the royal apartments where various monarchs have lived. A self-guided tour can easily be done by visitors. However, if you really want to get an in-depth knowledge of the place’s history, it is best to pay for guided tours. There are no facilities to store a range of personal items in the castle. Rucksacks over 30L and suitcases are not accepted in the site due to heightened level of national security. Security is also operating random bag searches which may result in longer waiting times for entry. A huge and wonderful place to explore, the castle has superb architecture and holds many different attractions within its walls. Make the most of your visit by taking advantage of complimentary guided tours and audio guides. Edinburgh Castle is a massive castle complex which has a very long history. The fortress dominates the skyline of the city of Edinburgh. It is divided into several parts and they serve different purposes. Located at the front of the castle and is now known as the esplanade where concerts are currently held. Laid out as a parade ground in 1753, it was extended in 1845. Built after the Lang Siege on the orders of Regent Morton to replace the round Constable's Tower which was destroyed during the siege. Located next to the Argyle Tower are largely occupied military buildings after the castle became a garrison in the early 18th century. 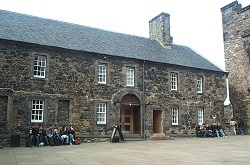 Located west of the Governor's House and part of the National Museums of Scotland, it was once known as the Scottish Services Museum and before that the Scottish Naval and Military Museum. Also known as the Citadel, the Upper Ward occupies the highest point of Castle Rock. The eastern end of the Upper Ward is occupied by the Forewall and Half Moon Batteries. 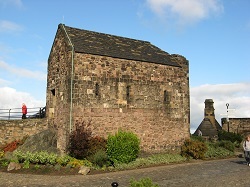 The oldest building in the castle and also in Scotland, St. Margaret's Chapel dates back to the reign of King David I. the chapel is dedicated to St. Margaret of Scotland. 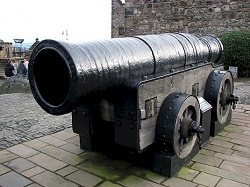 This 15th century siege gun us displayed on a terrace in front of St. Margaret's Chapel. It is also known as the great iron murderer called Muckle-Meg. 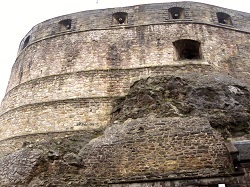 A prominent feature on the east side of the castle, Half Moon Battery was built between 1573 and 1588. The Half Moon Battery was built around and over the ruins of David's Tower. Also called Palace Yard, Crown Square was laid out in the 15th century during King James III's reign. There are four royal apartments that make up the Royal Palace, which were the residence of the later Stewart monarchs. The building has been extensively remodeled for the visit of James VII to the castle in 1617. 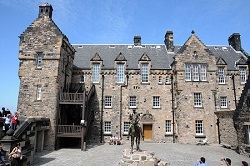 The chief place of state assemblies in the castle, the Great Hall was converted into a barracks for the troops of Oliver Cromwell during his seizure of the castle in 1650. The Queen Anne Building housed the kitchens serving the nearby Great Hall and was later the site of the Royal Gunhouse. The castle is closed on the 25th and 26th of December and open on the 1st of January from 11:00 am to 5:00 pm. There are many ways to get to Edinburgh Castle. Waverley is the main station. The castle can be seen from the exits. From Princes Street, go to Waverley Bridge. Haymarket Station is at the west of Princes Street. Take the Airlink 100 express from the airport and stop at Waverley Bridge, near the main railway station. Travel time is about 25 minutes. Edinburgh Castle is one of the most famous spots in Scotland, so it is only normal for it to be very busy. The best way to avoid queues in the Castle is to pre-book your ticket and purchase skip-the-line tickets. This will guarantee a queue-free entrance, though you will not be able to skip the crowds on place. This is where choosing a good hour comes in very handy. Guided tours are the worth it because they give you an in-depth experience of the castle and all the things that happened there since it was erected. One of the castle's main highlights is the One o'clock Gun so make sure that you stay around for it. it happens every day, except Sunday. Just be prepared because visitor number is also highest during that time. Weekends attract the biggest crowds so choose a weekday for your visit. There are mobility vehicles available for visitors. This car takes visitors from the esplanade to the castle's highest point and back down at the end of their visit. Edinburgh Castle has a timed ticketing system in operation. Edinburgh is a city with a very long history and there is so much to see there aside from Edinburgh Castle. There is the Edinburgh hop on hop off bus which can take you to all places of interest, as well as various Edinburgh city tours tickets which can make your visit worthwhile. We have taken the liberty to come up with a top tours list to make your visit more enjoyable. You've Visited The Edinburgh Castle, What Now? While Edinburgh Castle dominates the city's skyline, it is by no means the only attraction worth seeing. If you are in Edinburgh, there are plenty of other things to look forward to aside from the castle. This supposedly haunted abode is just five-minute walk from the castle and is home to the grave of Edinburgh's most loyal dog and mascot, Greyfriars Bobby. Visitors can also stop by the grave of Thomas Riddell, said to have inspired author JK Rowling when naming her greatest villain, Voldemort, also known as Tom Riddle. Situated just right next to the entrance to Edinburgh Castle, Camera Obscura and World of Illusions is the city's oldest purpose-built visitor attraction. Visitors can experience unique interactive exhibits which demonstrate aspects of optical illusions. Located near the top of the Royal Mile is the imposing St. Giles' Cathedral with its very own crown spire. Entrance is free but you have to pay a little extra for a guided tour. Just less than 10 minutes from the castle is the neoclassical Scottish National Gallery on The Mound. There are permanent and visiting exhibitions which include renowned works such as Claude Monet, Paul Cezanne, and Francis Bacon. Just around the corner of the castle and less than five minutes on foot is the National Library of Scotland. It was opened in 1925 and is one of the country's biggest libraries. Stretching between George IV Bridge and Grassmarket, Victoria Street is a charming winding street with cobblestones which may have been the inspiration of JK Rowling's Diagon Alley in the Harry Potter universe. Edinburgh is a place bustling with history and culture and is definitely worth the travel. Whether you are traveling from a London and needs some time away from the city or if Edinburgh is really the highlight of your trip, the city will not disappoint. Pick up the Edinburgh attractions map to guide you along the way and check on some free things to do in Edinburgh. So many personalities in history is fond of the city and it is very easy to see why. It has a certain charm that stays with you, even when you are no longer there. Buy a Rubik's Cube puzzle, the best Christmas present for anyone in the family.